Michael Wilpers is public programs coordinator at Freer|Sackler. Musical ideas abound in the work of American expatriate artist James McNeill Whistler (1834–1903), whose art is more abundantly represented in the Freer|Sackler’s collections than at any other museum in the world. Rather than use conventional labels for his works (such as “portraits” or “landscapes”), Whistler instead called them “harmonies,” “symphonies,” “nocturnes,” “variations,” and “arrangements.” But the connections between Whistler and music extend beyond these labels and their associated aesthetic concepts. The London of Whistler’s time was virtually consumed with the burgeoning form of entertainment called “music hall,” a variety-show genre comparable to American vaudeville and French cabaret. 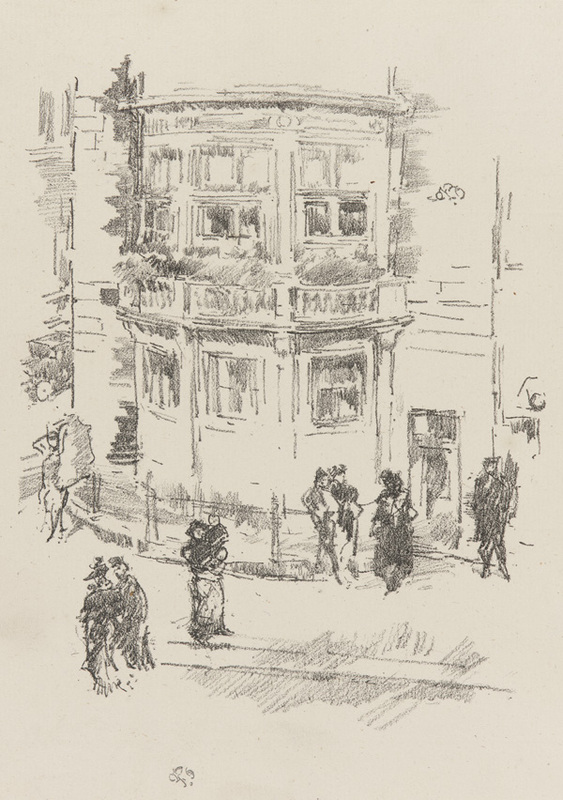 When Whistler arrived in London in 1859, the Canterbury Music Hall had just been converted from a 700-seat establishment to one that held 1,500 guests, featuring tables and chairs for dining, ornate chandeliers, and a capacious mezzanine. By 1875, more than 375 music halls were open in greater London, ranging from modest taverns to massive entertainment centers, all with music and comedy to accompany their beer and food. Perhaps it is not unreasonable to wonder if Whistler’s famous night scenes (nocturnes) were so lacking in people because they were all at the music halls! Along with sentimental and patriotic tunes, music hall’s trademark and biggest draw were its comic songs, replete with double entendre, tongue-twisters, and other risqué wordplay evidenced in such classics as “Pheasant Plucker” and the later “You’ve Got the Right Key but the Wrong Key Hole.” Such lyrics contributed to a culture of wit and conversational cleverness—of which Whistler was a proud champion. His playful, public conversations with Oscar Wilde were the talk of the town; he once famously claimed to have perfected the “gentle art of making enemies.” In addition, one might be remiss in considering Whistler’s relationship to music hall without factoring in his many romantic liaisons, which were certainly not inconsistent with the genre’s bawdy themes. Whistler also represented music hall directly in his artwork. The Freer collection includes several of his lithographs showing the exterior of the Gaiety Theater (pictured above), which opened in 1868 with a seating capacity of 2,000. In 1877, Whistler executed a portrait of one of the Gaiety’s child-stars, Connie Gilchrist, who was just twelve at the time. She became famous for her jump-rope dance routine, “taking the fashionable frequenters of the place by storm,” the Times noted, “her ingenuousness capturing all hearts, especially in contrast to the precocious cynicism of her stage dialogue.” Many artists and photographers created portraits of Gilchrist, who married well above her station, like so many of the “Gaiety Girls.” Of course, Whistler gave his portrait a musical name—Harmony in Yellow and Gold—with the overarching colors punctuated in three spots by the red of her lips and the two jump-rope handles. The British Players performing at the Freer Gallery of Art. 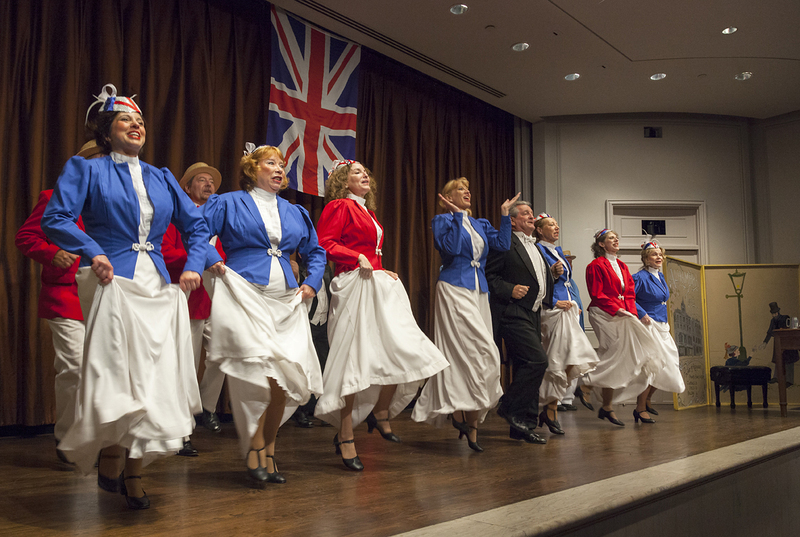 The British Players give a series of charity performances every December and June at Kensington Town Hall in Maryland, under the patronage of Lady Kensington herself. Their shows come complete with the requisite “chairman” (a wise-cracking master of ceremonies), bow-belles, the Chord Busters vocal quartet, the Edwardians (ensemble choir), can-can, and plenty of food and drink. For excellent material about music hall—its history, theaters, entrepreneurs, star performers, and sheet music covers—visit the Victoria and Albert Museum’s web feature and be sure to check out the related content. Previous Post Previous Post: Can Your Tea Jar Do This?